Not all dogs and cats who end up at shelters are unwanted. Some families abandon their pets because they cannot afford to feed them or house them or provide needed veterinary care. An article I read recently in the New York Times suggests that the “no-kill” shelter movement might unintentionally contribute to the problem. By focusing on getting dogs and cats into new homes, the shelters might be neglecting the reasons many of those animals are in the shelter in the first place. It might be time for some creative thinking and number-crunching. I’d guess that it costs less to feed a dog than to house him in a shelter until he can be placed in a new home. It certainly has less of an emotional cost for the dog and all the humans involved. Whether they never should have gotten a pet in the first place, or they were doing fine until a health crisis, job loss, or other financial disaster hit, many people who love their pets find themselves short of cash at one time or another. Finding ways to keep these families intact (pets are family too!) makes more sense than sending the dogs and cats to languish (or die) in shelters. I don’t for a minute think that that is the only reason animals end up in shelters, but it’s probably possible to make a significant dent in the problem. Here in Missoula, an organization called Animeals (which also has a cat shelter and cat adoption, foster, and hospice care programs) addresses some of these issues throughout Montana. Animeals runs a pet-food bank and delivers food to homebound, disabled, and senior pet owners, often providing the help that allows them to keep their pets. It feeds homeless animals as well, delivering food to volunteers who feed feral cats and dogs. Animeals also has programs to help families in crisis and to assist impoverished pet owners with vet bills. 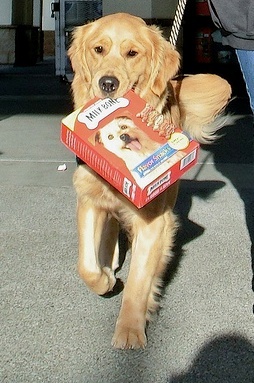 Some Meals on Wheels programs across the U.S. deliver donated pet food along with the humans’ meals. And I am sure that other cities or states have local initiatives. Check into what’s happening in your area and consider donating pet food or some of your time. It’s a relatively easy way to make a big difference.